Recognizing special right triangles in geometry can provide a shortcut when answering some questions. A special right triangle is a right triangle whose sides are in a particular ratio. You can also use the Pythagorean theorem formula, but if you can see that it is a special triangle it can save you some calculations. What is a 45º-45º-90º Triangle? A 45-45-90 triangle is a special right triangle whose angles are 45º, 45º and 90º. The lengths of the sides of a 45º-45º-90º triangle are in the ratio of 1:1:√2. The following diagram shows a 45-45-90 triangle and the ratio of its sides. Scroll down the page for more examples and solutions. Note that a 45°-45°-90° triangle is an isosceles right triangle. It is also sometimes called a 45-45 right triangle. A right triangle with two sides of equal lengths is a 45°-45°-90° triangle. You can also recognize a 45°-45°-90° triangle by the angles. As long as you know that one of the angles in the right-angle triangle is 45° then it must be a 45°-45°-90° special right triangle. A right triangle with a 45° angle must be a 45°-45°-90° special right triangle. How to solve problems with 45°-45°-90° triangles? Find the length of the hypotenuse of a right triangle if the lengths of the other two sides are both 3 inches. Step 1: This is a right triangle with two equal sides so it must be a 45°-45°-90° triangle. Answer: The length of the hypotenuse is inches. Find the lengths of the other two sides of a right triangle if the length of the hypotenuse is inches and one of the angles is 45°. Step 1: This is a right triangle with a 45° so it must be a 45°-45°-90° triangle. Step 2: You are given that the hypotenuse is . If the third value of the ratio is then the lengths of the other two sides must 4. Answer: The lengths of the two sides are both 4 inches. The following videos show more examples of 45-45-90 triangles. How to find the length of a leg or hypotenuse in a 45-45-90 triangle using the Pythagorean Theorem and then derive the ratio between the length of a leg and the hypotenuse? This video gives an introduction to the 45-45-90 triangles and shows how to derive the ratio between the lengths of legs and the hypotenuse. 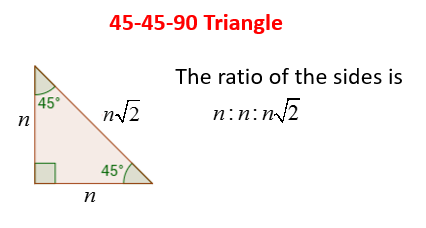 How to solve a 45-45-90 triangle given the length of one side by using the ratio? Example problems of finding the sides of a 45-45-90 triangle with answer in simplest radical form.